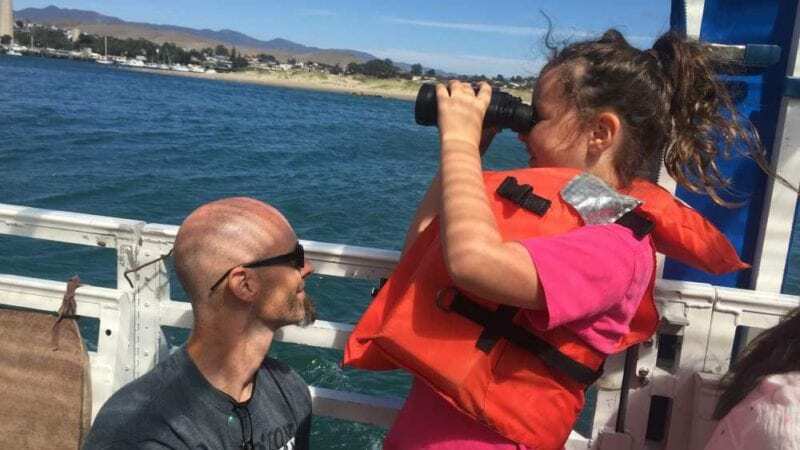 Marine life, clean beaches and budget-friendly lodging and attractions make Morro Bay a good choice for a family vacation on California’s Central Coast. 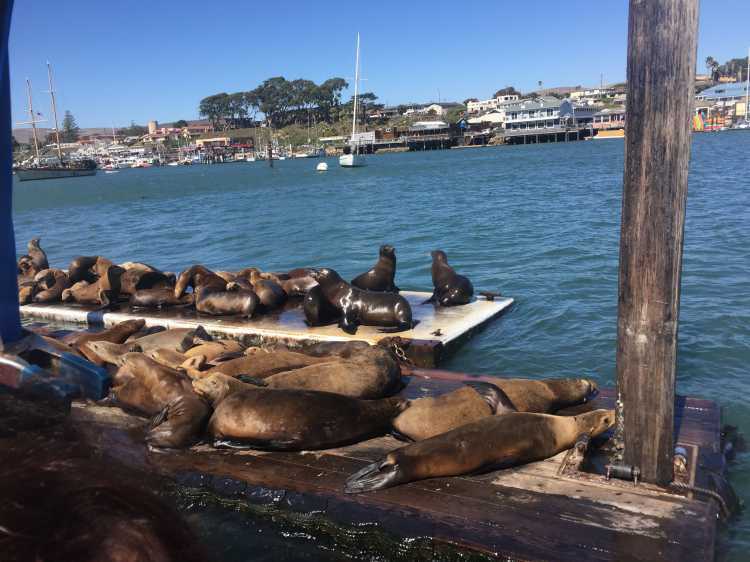 For a small fishing village in Central California, Morro Bay (population: 10,500) sure has a lot of fun family-friendly activities. No matter what you’re doing, you get a clear view of the town’s claim to fame: the 581-foot high Morro Rock, a State Historic Landmark. Whether you’re there for one day or longer, chances are you’ll fall in love with this quaint and charming town located about 15 minutes north of downtown San Luis Obispo and near famous attractions. We did. Morro Bay’s coastal location midway between Los Angeles and San Francisco makes it an easy and scenic commute for California travelers. From our home in Valencia – a suburb of Los Angeles – it’s a beautiful coastal drive to Morro Bay. Between work and college classes, we planned for just a two-day visit, so my husband, three college kids and our dog Trooper (Morro Bay is super dog-friendly) got an early start to arrive by noon and make the most of our stay. Before we went, we purchased a Morro Bay Adventure Pass (family pass $90), similar to CityPASS booklets which contain tickets for free or discounted admission to major attractions. The Morro Bay Tourism Board customized the Adventure Pass to include vouchers for local activities, attractions and free samples of jerky, candy and yogurt. We used our vouchers for a bay cruise, kayaking and generous beef jerky samples from House of Jerky. Vouchers can also be used for sub-sea tours, surrey rentals and admission to a small aquarium. Our noon arrival was perfect timing for a picnic lunch at Anchor Memorial Park (named after local fisherman lost at sea) on the waterfront. The small park has views of the bay, marina and Morro Rock. 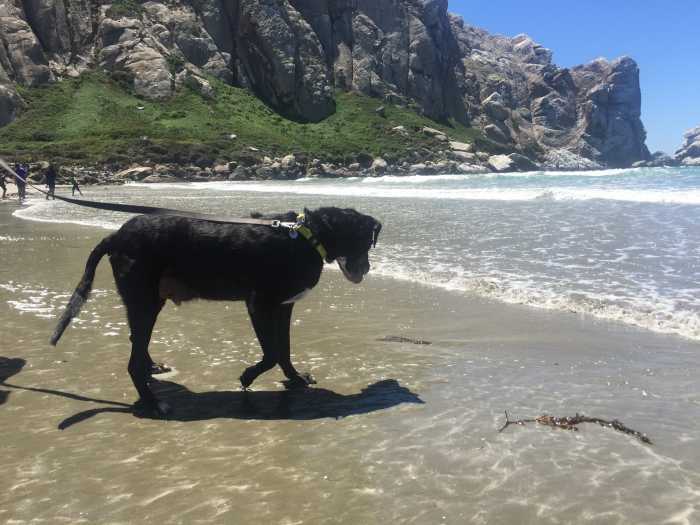 From there, we walked along a paved path with our excited and curious 12-year-old lab, Trooper, to the beach closest to Morro Rock, where he chased after shore birds and lunged into the small waves. Along the short walk, we saw a colony of otters swimming and floating in the calm bay. Captain Stew’s Bay Cruise is a great way to get on the water while soaking up some fun facts about the area. 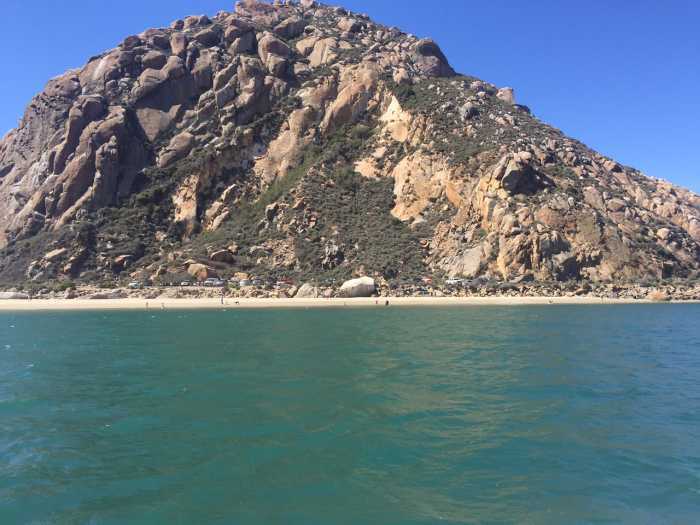 On the 45-minute narrated tour, we got the scoop on best beaches for kids and dogs, learned that cod is the most common fish caught in local waters and that Morro Rock is one of nine local volcanic plugs and was climbable until 1968. 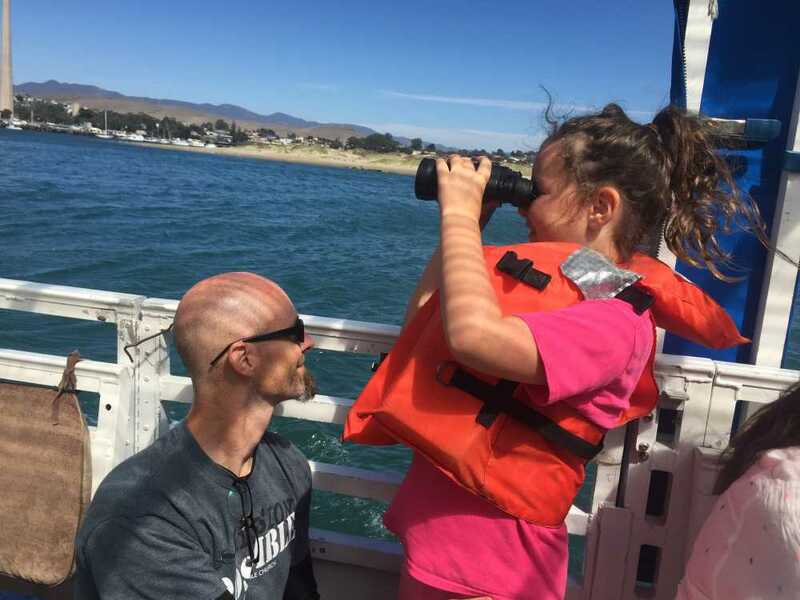 Our friendly captain cruised close to otters and a barge piled with about 80 barking sea lions. You can hear and see these sea lions from shore but they’re much more fun to see up close as they wriggle, wrestle and dive in and out of the water. Rates: $10 adults, $5 ages 12 and younger, free for ages 2 and younger. The Adventure Pass includes vouchers for this cruise. Mom and pop shops, laid-back eateries (lots of seafood options), water sport rentals and a couple of small public parks with picnic tables line the small, scenic waterfront and embarcadero. Unlike many other beach cities, here you can sit at bay-view tables and chairs placed adjacent to restaurants and shops without making a purchase to watch the marina scene. That’s one of the many things we like about Morro Bay – nature and a welcoming, laid-back ambiance. Plus, hotels, activities and attractions are priced low, making a family vacation easy on the wallet. We took a relaxing stroll, stopping at places such as Carousel Taffy, an old fashioned candy shop with barrels of flavored taffy that include mango, peaches and cream, lemonade, chicken and waffles, rum and many more. We bought a bag of our favorites for about $4. 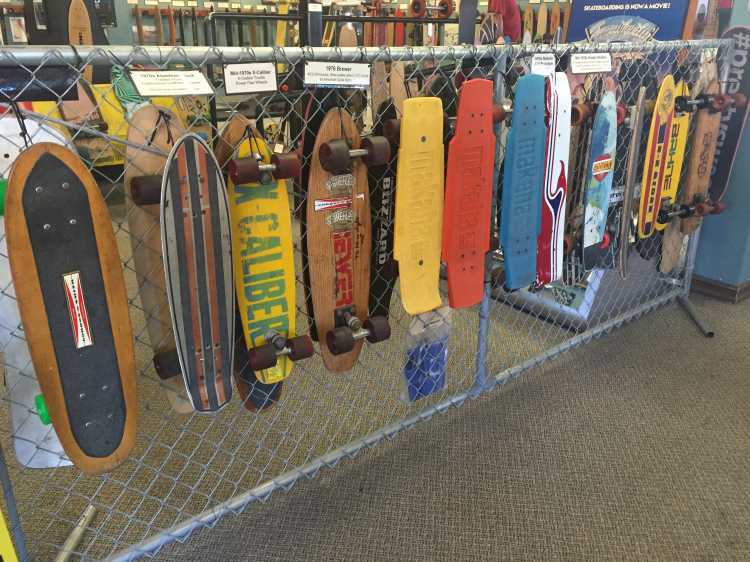 Worth a visit (especially if your kids love skateboarding) is the Morro Bay Skateboard Museum, which features a collection of over 200 skateboards from all eras. If you skateboarded as a kid, you’ll probably find a board similar to yours. Free admission. At The Shell Shop we browsed through displays and exhibits of shells from more than 22 countries. The variety of shells, clams, corals, specimens and other items was impressive. Since 1955 the shop owners have been traveling and collecting these exquisite treasures, so there’s a lot to see. After an afternoon at the beach and exploring the small town, we walked to dinner at the family-owned Tognazinni’s Dockside Restaurant. The family owns and operates three side-by-side restaurants: the original restaurant, Dockside Too and Dockside Three. We ate at Dockside Too, which features live music and a dog-friendly patio that overlooks the bay. The casual eatery offers a good selection of seafood, sandwiches and burgers that you order at the counter and eat outside on plastic chairs and tables. The bill for our family of five came to just $67. 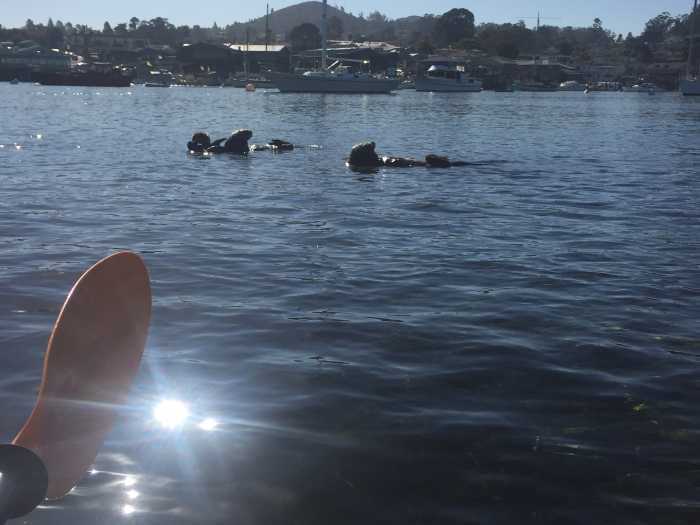 A trip highlight was a morning kayak around the serene bay, an estuary where numerous sea lions splashed alongside us and curious otters swam nearby. As we settled into our kayaks, the shop’s owner advised us to cross the bay to make paddling easier with the rising tide. We maneuvered around colorful, bobbing boats and took photos of the wildlife around us. The ride back was a breeze as the current carried us along. What an exhilarating start to the day! Another Adventure Pass attraction. 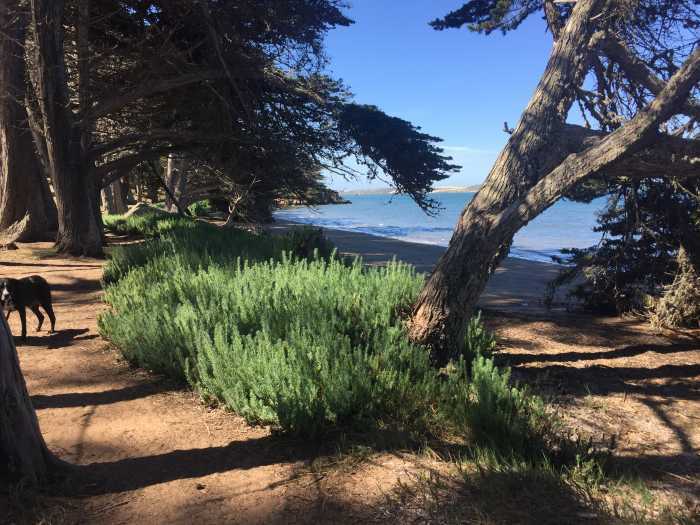 The pretty 2,770 2-acre state park has forested walking trails, a lagoon ideal for stand up paddling, the Morro Rock Natural Preserve, the Heron Rookery Natural Preserve, the Morro Bay Star Park Golf Course and the Museum of Natural History (free admission for ages 16 and younger). Free park admission. We stayed at the very modest Rockview Inn & Suites, less than a five-minute walk to the waterfront and about a 10-minute walk to the Morro Rock and beaches. Like many small beach and mountain towns, lodging can be quirky but decent. While the Rockview is nothing to write home about, it’s clean and the family suite was spacious enough for our family of six (that includes Trooper). Three double beds (one in a separate bedroom), a mid-size fridge, microwave and 32-inch flat screen TV made this basic hotel comfortable for a short stay. Our view was of the parking lot, but walking a few short steps we could see Morro Rock and the waterfront. The complimentary breakfast was simple but included cereal, waffles, toast, juice, milk and coffee. The free WiFi worked well after the owner rebooted the router for our room. Front desk staff was helpful in providing maps and information about their favorite beaches, parks and restaurants.